For eight nights, beginning with the eve of 25 Kislev (4 December), candles are to be lit in commemoration of Chanukah, the feast decreed in the Apocryphal Books of the Maccabees and in the Babylonian Talmud Shabbat 21b. For centuries, these days were marked in home and in synagogue in quite simple ways. In more recent decades, Chanukah has assumed a new and more significant profile with more elaborate celebrations.There is a marked difference between the reasons for celebration of these days between the Books of the Maccabees and the Talmud. While historian, Flavius Josephus – formerly Joseph ben Gorion haCohen and commander in chief of the Judean forces in the Galilee in the first century CE – records the historical events of 168-165 BCE, when the descendants of the priest Mattathias rose in armed revolt against the Hellenistic overlord King Antiochus IV Epiphanes and created a satrapy of the Syrian empire known as the Hasmonean Dynasty. The Talmud offers a miracle at the conclusion of their revolt, when the despoiled Temple in Jerusalem was cleaned and purified and a last cruse containing olive oil sufficient to light the ancient Menorah for one day continued supplying necessary light for the sacred light for eight days while a new consecrated supply was made ready. Each has its own relevance and truth: The Hasmonean Revolt stemmed from the imposition of martial law in ancient Judea by an impatient monarch that included the imposition of Hellenistic worship in the Temple, a violation severe enough to cause the conservative Mattathias to refuse to take part in it, even in his own home near the modern city that bears the ancient name of Modi’in. The Temple itself was rendered unfit for the worship of God; it was not destroyed. Restoration of the purity was one result of the victory of the Judah, Simon and John, who are known as the Maccabees [Flavius Josephus, Antiquities of the Jews, translated by William Whiston, Book XII, especially Chapters VI & VII]. The military nature of the Maccabees victory became increasingly problematic over the next centuries. As the fate of Judea descended under the rule of Rome, and especially after the catastrophic defeat that left the Temple in ashes and Jerusalem’s high places dedicated as Aelia Capitolina – the City of Zeus – the revision of the holiday had a new political imperative. The uprising became information largely suppressed; the Books of the Maccabees exist now only in the Greek translation preserved in Christian Scripture. At the end of the 19th Century, however, the growth of political Zionism elevated the stature of this great and successful Jewish uprising. Growing prosperity and an increased awareness of the potential for Jews to create our own homeland by resettlement, land purchase and personal dedication to Eretz Yisraeil – the Land of Israel – made Chanukah an important time of the year. While some assert that it is the arrival of contemporary consumer culture, the Zionist appeal is even earlier. In the synagogue, the eight days are marked by reading from the Torah, with prescribed selections taken from Numbers chapter 7-8 & 28. These readings describe the gifts offered at the dedication of the Tabernacle in the Wilderness. The daily service also includes the reading of the group of Psalms called Hallel [Psalms 113-119]. These special aspects to the worship offer some real evidence in a search for the original meaning of the holiday – for they duplicate the readings that are included on the much more important festival of Sukkoth, which is associated with both the dedication of the original portable Tabernacle and the First Temple constructed by King Solomon. From a Progressive Jewish standpoint, the current high status Chanukah poses some real challenges. The Hasmoneans were strong opponents of the part of the population that accepted the aesthetic and life style of Hellenistic society. Their conservatism and opposition to change was supported by the ideology of the Sadducees. The Pharisees, whose ascendancy after this period became complete, were opponents because they sought to interpret Torah in ways that opened Judaism to the broader world of Hellenistic society. What shall we do? In the opinion of this writer we should light the lights as a remembrance of the adaptability of Judaism through the eight nights of Chanukah. They are sacred lights, not used for illumination, and while they burn – standard Chanukah candles last about 18 minutes – we should enjoy the latkes and dreidels, the songs and stories that make the holiday beloved. It would probably be preferable to minimize the gift-giving, perhaps substituting our own acts of tikkun olam – repairing the world – by offering appropriate gifts to the needy and poor, or to organizations whose work is the betterment of life and care of the environment. Above all, this is a time for family and bridge-building. Watch the lights burn, and instil the light from generation to generation. 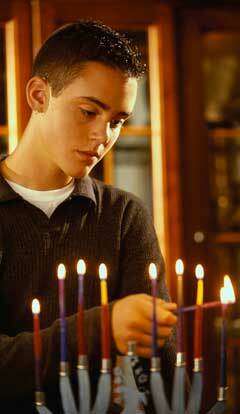 See the Chanukah article on Judaism 101. Rabbi Robert Jacobs talks about the meaning of Pesach for our personal liberation. Two modern Pesach rituals, little-known in South Africa, bring a feminist angle to the celebrations. By Rabbi Greg Alexander of Temple Israel, Cape Town. Rabbi Robert Jacobs talks about Sukkot, when the Ohel Mo’ed, the Tent of Meeting, is dedicated.